Many regional interactive marketing associations are busy with panels and symposia about digital marketing strategy and tactics - even exchanges! The Atlanta Interactive Marketing Association (AIMA - Facebook link) provided a panel to its members on ad networks and exchanges this past week that included Google and Yahoo!. Upcoming, on April 8, the IAB comes to Atlanta for a discussion of the organization's latest initiatives and challenges. Presenters include Peter Conti, Senior Vice President, Borrell Associates, Paul Iaffaldano, EVP and GM of The Weather Channel and Steve Shaw, Senior Vice President, Cox Cross Media. The Boston Interactive Marketing Association (BIMA - Facebook link) along with MITX will be hosting a panel that GroupM T's and C's lovers and haters will enjoy: "Who Owns Data? " on April 30. In NYC, the Advertising Club of New York (Facebook link) is holding a cocktail and shmooze event for all members. Non-members and the AdExchanger get in for 10 bucks. Everyone else is free. The Minnesota Interactive Marketing Association (MIMA - Facebook link) will be hosting an event with Bob Thacker, Sr. VP, Marketing & Advertising for OfficeMax, to discuss, well, Bob - and the future of advertising. The Dallas Fort Worth Interactive Marketing Association (DFWIMA - Facebook link and another) is holding a discussion Tuesday, March 31, on portals. Panelists include Deidre Richter, Regional Sales Manager, Microsoft; Matt Comstock, Strategic Account Director, Yahoo! and Bob Roden, Regional Director at AOL/Platform A. Also, DFWIMA is asking members to submit entries for its regional interactive awards this May to be sponsored by Platform-A. The 1,000 member Chicago Interactive Marketing Association (CIMA - Facebook link) is having its 2009 CIMA Spring Social on Thursday, April 23rd at Rockit Bar and Grill. Among the cocktails - the always dangerous, CIMAtinis. The South Florida Interactive Marketing Association (SFIMA - Facebook link) is holding a presentation entitled, "The Role of Landing Pages in Improving Web Site Conversion" during which an American Greetings case study will be presented. Takeaways from the April 9 event "include best practices for running simple, high- impact A/B tests that any front-line marketer can easily implement and understand." ThinkLA (Facebook link) in Los Angeles is putting on its annual conference from April 30-May 3 at Rancho Las Palmas Resort & Spa. Speakers include: Roy Spence, Chairman & CEO, GSD&M Idea City; Rita Drucker, SVP, Film Promotions, 20th Century Fox; Greg Johnson, SVP, William Morris Agency; Lisa Licht, SVP, Global Marketing Partnerships, Hasbro; and Fred Sattler, EVP, Managing Director, Initiative. 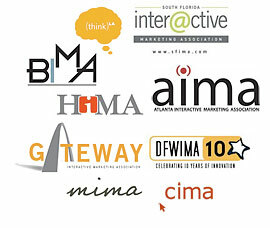 Gateway Interactive Marketing Association (GIMA - Facebook link) in the St. Louis area will have a panel on April 15 called, "Creating Lasting Partnerships between Companies and Agencies." Dan Callahan from Elasticity, Jim Ruszala from Maritz and Kimberly Fletcher from Fleishman Hillard will be among the participants. The Houston Interactive Marketing Association (HIMA - Facebook link) will have its monthly event devoted to the "green" economy with its April 1 panel, "Green Talk: Getting Skeptics to Buy Using Interactive Marketing Tactics." Panelists will include MARY FRANCES Blatchley, founder and president for both forBri, Inc. and forGreen Marketing and Design; JEFF Kaplan founder of New Living; and JESSICA Zapatero, Founder and Director at Green Lily Events. Finally, the Triangle Interactive Marketing Association (Facebook link) in North Carolina will be holding its social on April 15. Details to follow.